Today i came up with a new recipe to take to a gathering of friends. The jury is still out on how it tatstes, but I am expecting it to be a hit. So here's what I did. In a large bowl, combine the cheddar, fontina, romano, and gruyere cheeses. Add the corn starch and toss to coat. Set aside in the refrigerator. In a large fry pan, fry the bacon until crisp. Remove from pan and drain on paper towels. Reserve the bacon fat. Add 3-4 Tbsp of bacon fat back to the pan, heat, then add the ham. Fry until slightly crisped, about 3-5 minutes. Remove the ham and drain on paper towels. Clean the pan. Add 2 Tbsp. bacon fat and the butter to the pan, melt, then add the leeks. Add a pinch of kosher salt and the marjoram and sautee about 3-5 minutes until translucent. Set aside. Butter a 13x9 baking dish. Layer 1/3 of the potatoes in the bottom, then sprinkle with a little koser salt and 1/2 the nutmeg. Add a few grinds of black pepper. Then add 1/2 of the ham, 1/2 of the bacon, 1/2 of the leeks, and 1/2 of the cheese, evenly spread out. Repeat the above with another 1/3 of the potatoes, season with salt, pepper and the remaining nutmeg, then top with the remaining bacon, ham, leeks, and cheese mixture. Finally top with the last 1/3 of the potatoes. Now mix the heavy cream and chicken broth together and pour over the potatoes. Press down. Season slightly with salt and pepper, then finally top with the Sargento cheese-mixture. Cover with non-stick aluminum foil. Bake for 30 minutes covered at 325 degrees. Remove foil, increase temperature to 400 degrees and bake another 45 minutes until potatoes are tender (insert a sharp knife to test). Let rest 15-30 minutes. Serve. 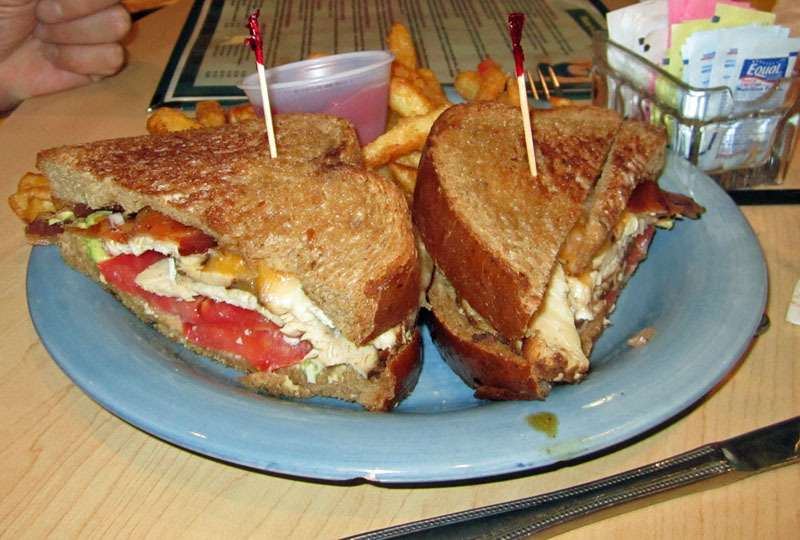 Dexter's of Lake Mary is almost always busy, and there is a reason why. Good location, decent food, and nice atmosphere. My friend Tommy and I went to Dexter's on a recent Friday night. It was actually our second choice in the area, but had less of a wait and they promised us an outdoor table on a pleasant Spring evening. It was worth the short 20-minute wait as we had a great view and good food. We started off with an appetizer. We had the Chicken Egg Rolls. They were very good! Two large egg rolls had been stuffed with mixed asian vegetables and chicken, then deep fried, sliced diagonally, placed on a bed of dressed, mixed greens, and sprinkled with a bit of chili powder. They were served with a sweet/sour chili dipping sauce. They were indeed very good. 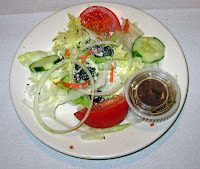 We ate every last morsel, including the salad--it was that good. I ordered a salad with my meal and it was a very nice salad. 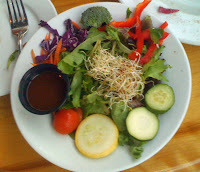 Mixed greens were "accessorized" with red peppers, mixed julienne of cabbage and carrot, a bit of cucumber, a cherry tomato, a bit of broccoli, a slice of summer squash, and a cherry tomato. The dressing was a house chili lime viniagrette. The whole salad was very good, nice and light and refreshing. 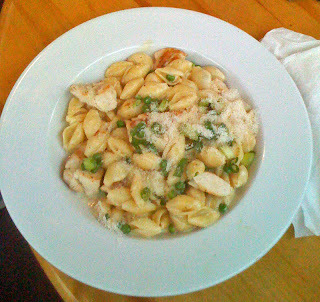 For my main course I had the Parmesan Shells with Chicken. It was very good. A nice and simple dish, but all the flavors had a change to blend and marry, so it tasted very good as a whole. Shells were covered with an alfredo sauce, some tender chicken chunks, peas, and was garnished with chopped green onions and som shredded/grated parmesan cheese. It was also a huge serving. I had lots lefover to take home and enjoy another time--and I did! The chicken was tender and moist, the alfredo sauce was not overbearing, and the peas added a nice fresh touch. A very good dish. Tommy had a burger, the Grilled Colby Cheeseburger. It was also very good. 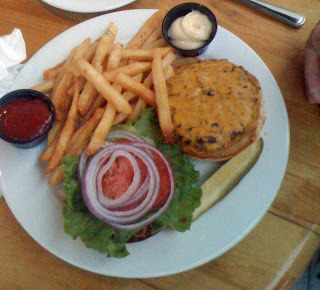 A substantial-portion Black Angus burger was grillled to medium, then covered with melted colby cheese, served on a nice roll with tomato, onions, and lettuce. The burger was very good, nice and moist and juicy. The accompanying fries were good as well. Overall, we had a very enjoyable time here at Dexters. And sitting outside on a pleasant evening was quite a bonus, too. We'll be back! There is a good reason that Hollerbach's Willow Tree Café is rated so high on urbanspoon.com...well, actually two good reasons: (1) good food and (2) great atmosphere. I have been to Hollerbach's a number of times, and will keep coming back time and time again. My friends and I ate here recently during the ever-popular Alive After Five event in downtown Sanford--it happens every month on the third Thursday of the month and is always a fun time. 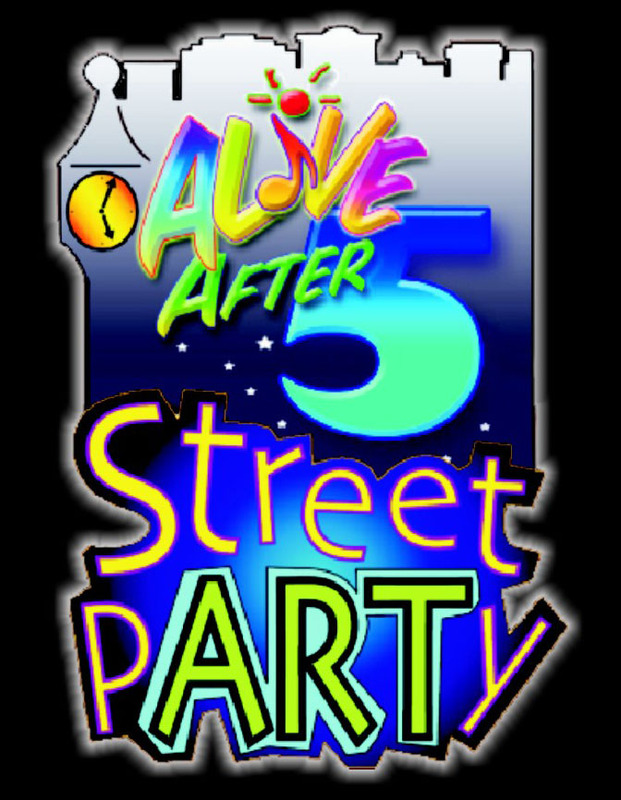 We were lucky to go at a good time and get a table immediately, outside where we could watch the street party going on, and later where we could hear the music inside. It was a great evening out. 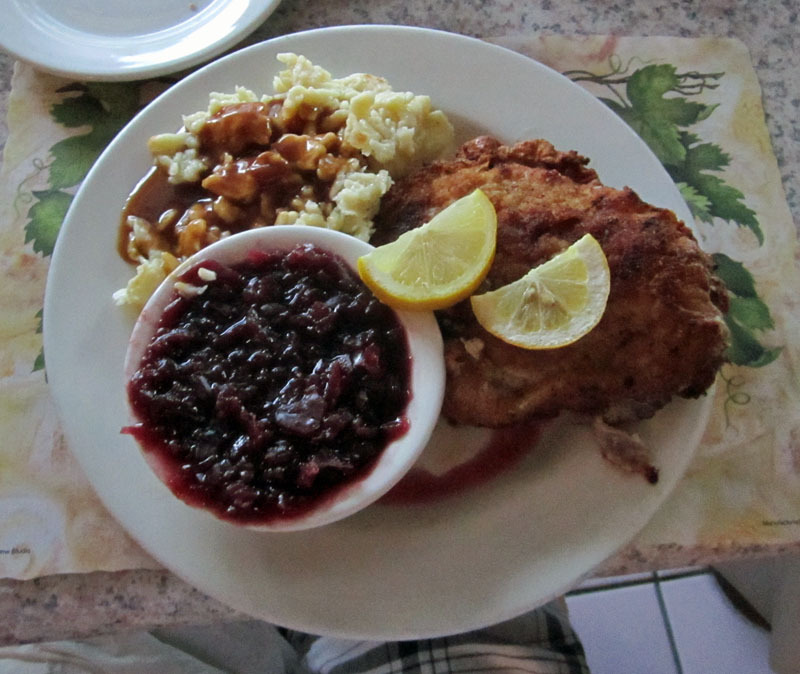 I had the Chicken Cordon Bleau Schnitzel and it was pretty good. The chicken was just a bit dry, but overall I enjoyed it a lot. There was a lot of food, and I had a decent sized portion to take home and enjoy another time--which I did. I also had the spaetzel and the red cabbage to go with, both very good. 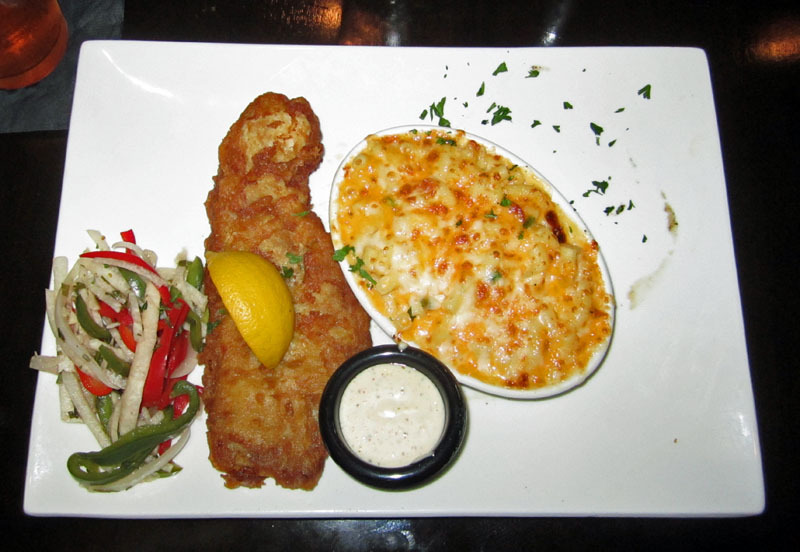 We all enjoyed our meals here as well as the fun atmosphere and mostly attentive service. It shows why they have such a high rating. Yumm! My friends and I had a nice meal at Hamburger Mary's Bar & Grille recently. They really do make a decent burger, the waitstaff is very efficient and pleasant, and the atmosphere speaks "fun." Yes, it is a chain, but a small chain. And no matter, they do make and server a very good burger. We arrived on a recent Saturday night to find a full house--seems there was a Magic game starting soon at the nearby arena. No matter, we had a table within 10 minutes and shortly thereafter the place cleared out as the fans headed to the game. 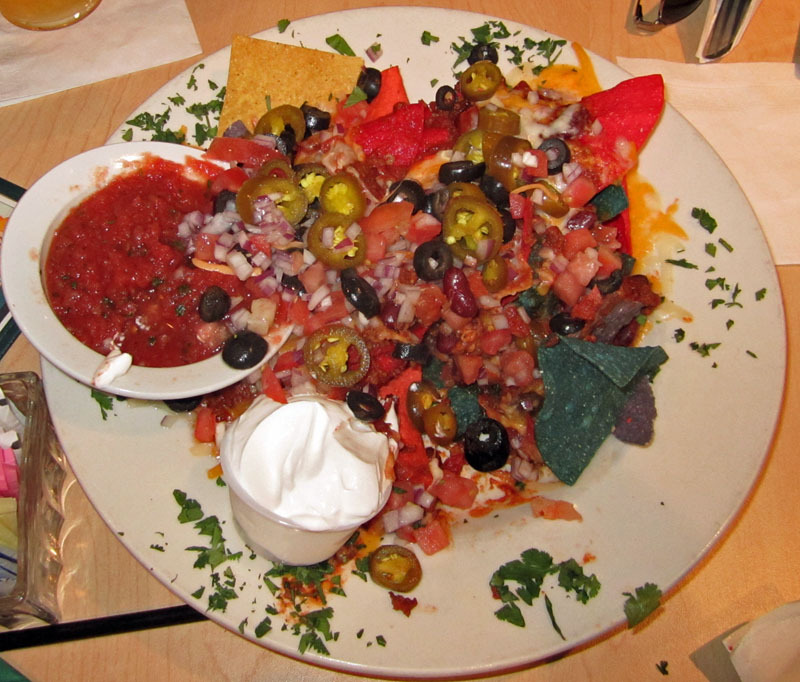 We started with a plate of the Macho Nachos--rainbow tortilla chips loaded with chili, cheese, onions, black olives, and jalapenos, and served with a bit of salsa and sour cream on the side. They were pretty standard nachos, but pretty darned good. It was a pretty good-sized pile of nachos, but somehow the four of us managed to put a very good dent in them, along with a few beers. Yumm. For his meal, my friend Tommy ordered the Bird of Paradise--sliced roasted turkey with tomato, avocado, and bacon, served on wheat bread. It was topped with melted cheese and the bread was dressed with an herb mayo. 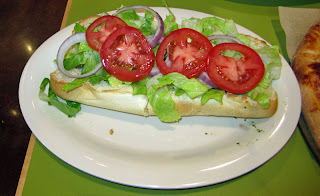 It was a very good sandwich and quite a substantial size. To go-with he had french fries. They were excellent, nice and hot and crisp with a great potato flavor. It was a good meal. 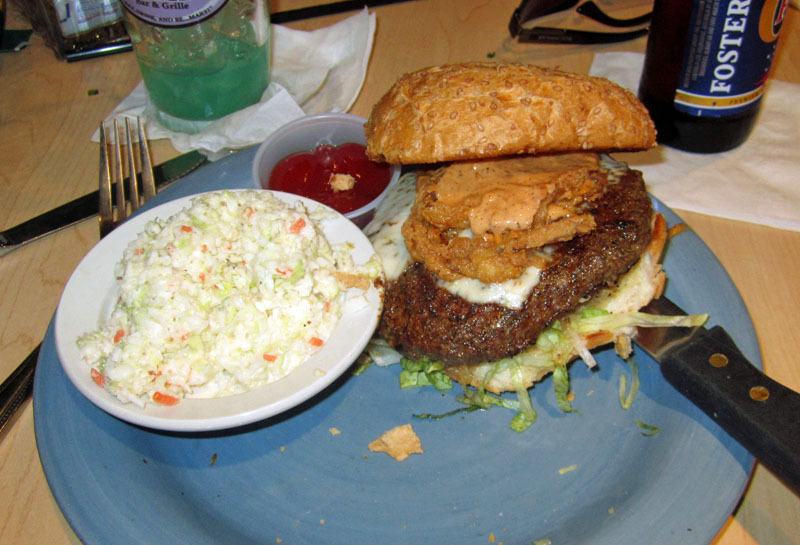 For my meal I had the Black Jack Burger with a side of coleslaw. The burger itself was cooked to medium rare as I requested, maybe just a bit past, but still moist and juicy. It had been dusted with blackening powder before being grilled and had that nice char-grilled flavor, very good. It was topped with melted pepper-jack cheese, crispy onion rings, and a spicy cajun mayo. Now personally, I could have used just a bit more heat, but it was a very decent sandwich, no doubt. I managed to eat it all. The coleslaw was good but fairly orinary, just good ole coleslaw. We had a very nice time here with our friends. Gerritt, the waiter, was attentive and entertaining, as well as efficient. It was a good time and I'd come back again, in part for the good food, and in part for the fun atmosphere. We had a slice of pizza with our dinner at Vivona's Pizzeria the other night, but the slice that we shared was the high point. It was good. But the rest of our dinner was mediocre at best. I was disappointed overall. We arrived late on a Saturday afternoon to find only one other table occupied, but by the time we left, there were four or five tables full. Well, the place has only been open two months, so maybe people have not found it yet. I did notice several take-out orders going out while we were there. Hopefully their pizza good, and much better than their meals. Our waitress was, I'd say, rather new to her job. She was helpful and courteous and checked in on us a number of times, but still could have used a bit of polish, it's the little things that add up. Still, for a lower priced pizza joint, she did well. We asked about a few menu items, she had to check on one of them. Well, that's OK, they have a huge menu--and therein, i believe, lies the problem. Our dinners came with salads, and they arrive promptly.They were average salads, but very fresh. Fresh iceberg lettuce with a few garnishments. The dressing was served in a little container. Now I got the raspberry viniagrette, but in a container that's always a hazard as the oil has usually risen to the top. I did shake it (with a bit of fear and trepidation). It was OK and the salad was tasty. Not much more to say about it. 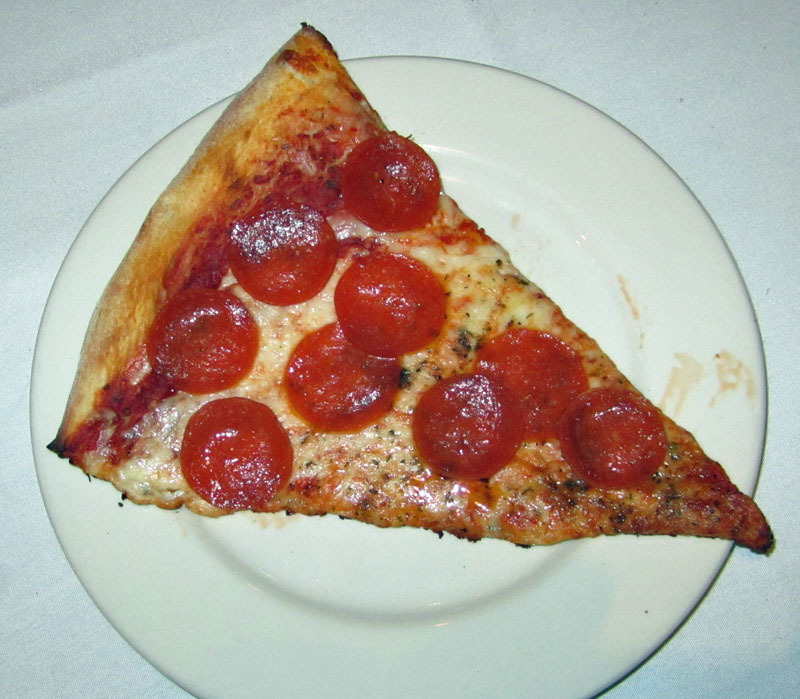 We ordered a slice of pepperoni pizza as an appetizer--though it came out with our dinner, and two dinners. The slice of pepperoni pizza was actually quite good, nice and hot, a nice oregano flavor in the sauce, and an ample amount of sauce. I'd probably come back just to have the pizza. It was also a very good sized slice. It arrived hot and yummy. I'm sure it was a pre-made slice of cheese pizza with pepperoni added, but still, it was pretty decent pizza. 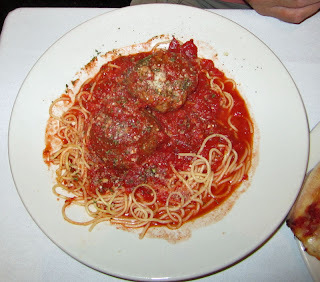 For his main course, my friend Tommy ordered the Spaghetti and Meatballs. It was a pretty good sized portion. The marinara sauce was pretty decent, nice and fresh taste. 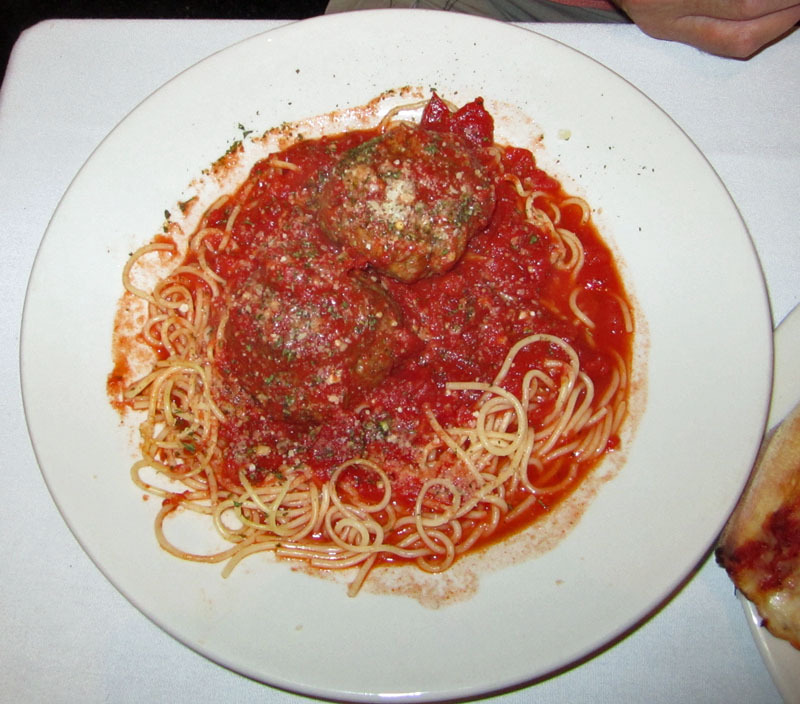 The meatballs, while they had a good taste, had an odd texture. It seemed more like a meat paste than ground meat in a ball. Like it had been ground a few too many times, or overworked by quite a bit. The taste was good, but the texture just strange. After a few questions on the menu items for the waitress, I ordered the Chicken a la Vodka. It was a large portion and served piping hot. It was just OK though. Here's what it seemed like to me. It seemed like a bunch of individual components that were thrown together at the last moment and put together on a dish. As a matter of fact, a bit before we were served, our waitress asked me if i wanted it with broccoli and sun dried tomatoes. I said "yes" but thought to myself "don't they know how to make their dish?" 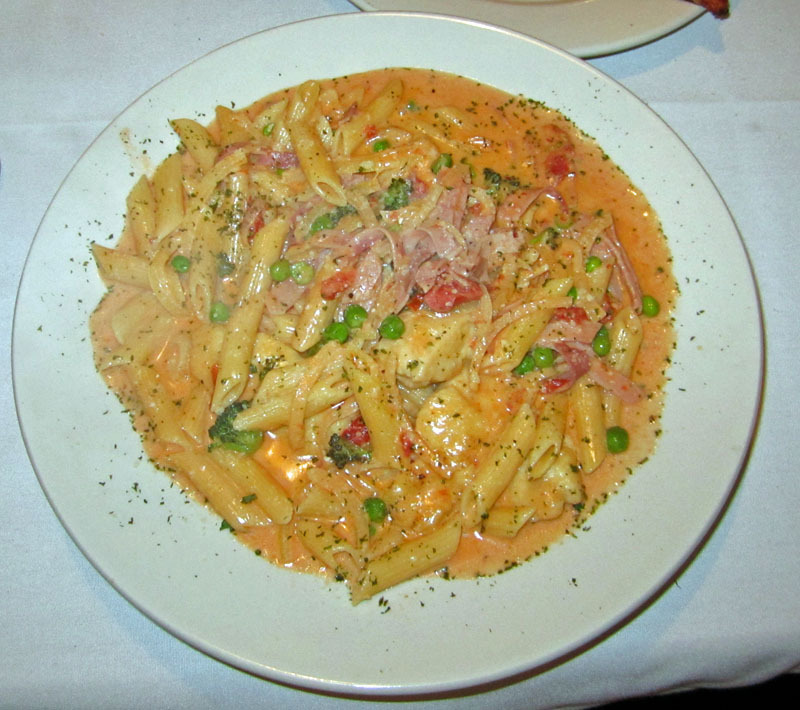 The penne was a bit lifeless as if it had been held a bit too long in water. The vodka cream sauce was a bit thin and not all that flavorful. The chicken, while nice and tender, had no flavor from the sauce (because i'm sure it first met the sauce moments before they ended up in front of me). The other compenents included sliced ham, peas, onions, and a few other things. The dish could have benefit from a bit of acid, like artichoke hearts or something. It was OK, it just did not come together as a dish. Both of our portions were huge. We each had enough to take home and eat another meal, so that was good. But i just got the feeling that the extensive menu was too much, too big, trying to please too many people. And so I'll bet all the components are ready, and when ordered, everything is quickly put together, heated up a bit, and then served. Too bad, as it has some potential. One last note. Our meal could have benefit from some bread. Why no bread? When you have Italian sauces like we did, they beg for some bread to sop up the sauce. So, overall, I was a bit disappointed. I hope the pizza is much better, and our one split slice seemed to indicate that as the case. 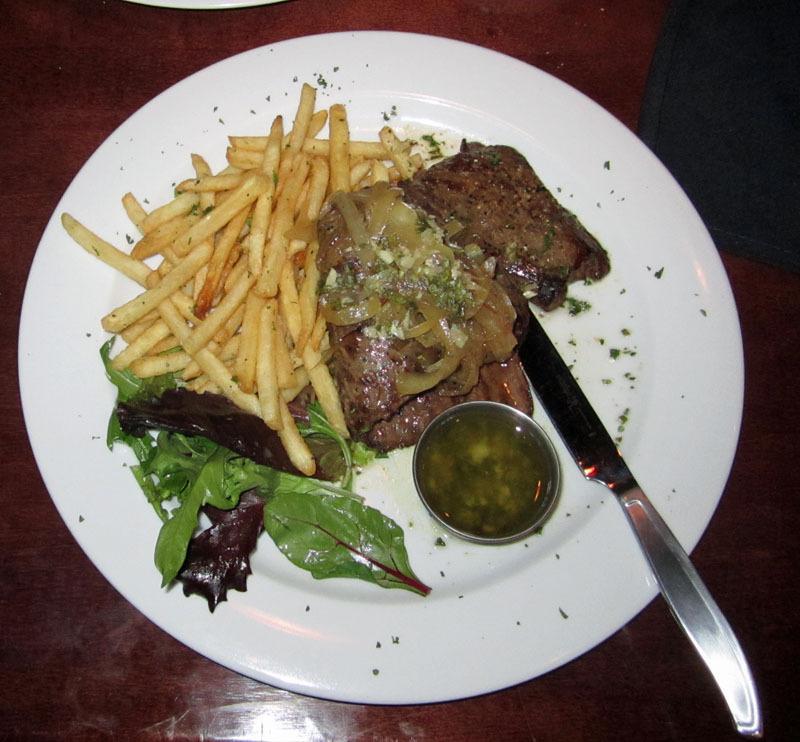 Pint American Gastropub is a very new addition to the Lake Mary restaurant scene, only open a few weeks now. My first visit there left me liking it. They name refers to the wide variety of beer they serve--they have dozens of craft beers on tap, and an extensive selection in bottles as well. I had a Ukrainian beer in a bottle, Obolon, and it as quite good for a lager--way better than most mainstream American beers. I also had a Longhammer IPA on tap--always a good choice. But we really came here for a light dinner, and we left full and not disappointed. I ordered the Fish and Chips, but substituted Macaroni and Cheese for the chips. A substantial filet of fish was breaded and fried nicely, served with a chipotle mayo. The chipotle mayo was good, but I could not really detect the chipotle part of it, it was very very mild. Accompanying my meal was a bit of Jicama slaw, marinated jicama, red and green peppers, and red onion, with a bit of cilantro. It was nice and refreshing. The macaroni and chesse was good, too, boasting several varieties of cheese, as well as bacon. How can anything with bacon in it be bad, right?? 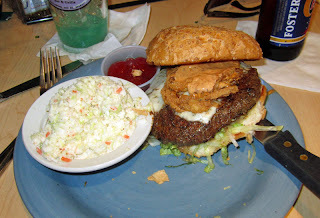 My friend Tommy had the Simple burger, It was simple but very good, cooked perfectly to a medium as he requested (too much in my book, but it was his burger) and was tender and juicy--I had a big bite! He enjoyed the burger and the mac n cheese as well. Much much better than a nearby place with "burger" in it's name that killed our last (and only) burgers there. This was so much better. It was served with cheese, and with some lettuce and tomato. Yumm! Our waitress was Katelynn, and she was prompt and attentive, showing a good knowledge of the menu and fair knowledge of the beer selection. Twice during our time there a manager stopped by to ask if everythign was good--and it was. As we were leaving, someone was setting up to provide live music later in the evening. The area is a hotspot of night activity, so I was not surprised. 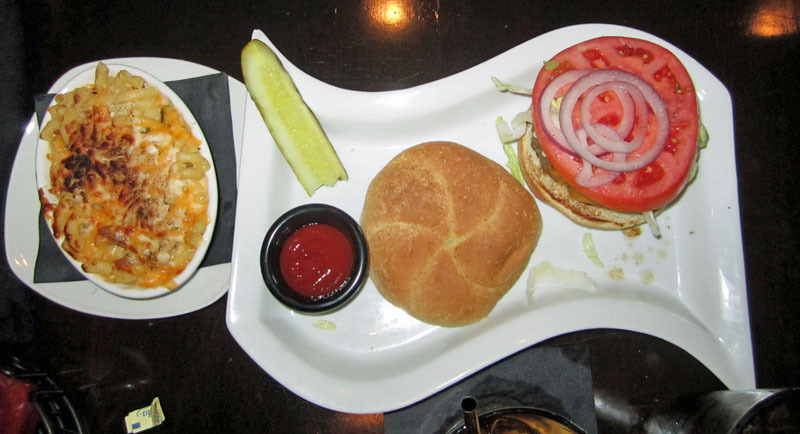 Pint may not have quite the extensive collection of beers that World of Beers nearby boasts, nor quite as many TVs, but it has food, which WOB does not. Both places, I think, will have their place in the Lake Mary/Heathrow night scene. Nice job! 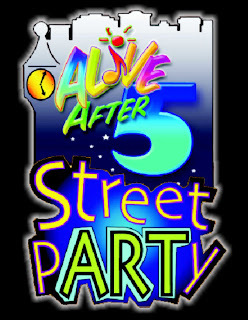 Join me at Alive After Five this coming Thursday, April 14th in Downtown Sanford from 5-8 PM. What is it? Well, it a big street party. It's free to walk around but a $7 wrist band gets you a dinner ticket, free samples from all the local food vendors, and ridiculously cheap beer--it can't be beat. I can usually be found hanging out at Art Affair Gallery, one of my favorite places. Some months I even do the cooking, but not this month--this month I'm all about the eating! I'll also be going up and down the street, sampling food, and visiting all the galleries. I've been attending Alive After Five for about a year and a half now, and have become a "regular." My friend Tommy is an artist in residence at Art Affair Gallery, too. You should stop in and see some of his wonderful work. C'mon down, it's a lot of fun! Flippers Pizzeria is a chain that recently opened a location in Lake Mary, so my friend Tommy and I recently took the opportunity to try it out, searching for some good pizza. We were not disappointed. We arrived on an early Saturday evening to find them fairly busy. We were quickly greeted and told we could sit wherever we wanted. One comment about sitting inside--it's very noisy. They could use some sound-dampening scheme here. It was hard to hear the waitress and carrying on a conversation was a bit of a challenge at times unless you like to speak loudly. Next time I think I'd consider--or rather, prefer--to sit outside where it's quieter. I can only guess what it would have been like with a bunch of rowdy kids inside! That said, we were quickly greeted, drinks arrived promptly, and our order was taken. We ordered a pizza and a sandwich, to split both. For the sandwich, we ordered the Turkey Pesto, turkey, smoked bacon, provolone cheese, lettuce, tomatoes, red onions, roasted red peppers, pesto, and mayo. The presentation, as you can see, was very nice. The sandwich was also very tasty, though getting all the ingredients to stay together was a bit of a challenge, it was a good sized sandwich. The bun that it was served on was exceptionally good, nice and fresh and tastly. It was very tasty with one exception--the red onions were very strong. They were either old, or just strong--I suspect the latter as this is not a great time of year for onions, I've found. I needed to pull them out, they were that overpowering. But otherwise, the sandwich was very tasty and a meal in itself. Fortunately, there were two of us sharing it. We also ordered a medium (12") Windy City Pizza, boasting extra sauce, double sweet Italian sausage, provolone, and pecorino romano. 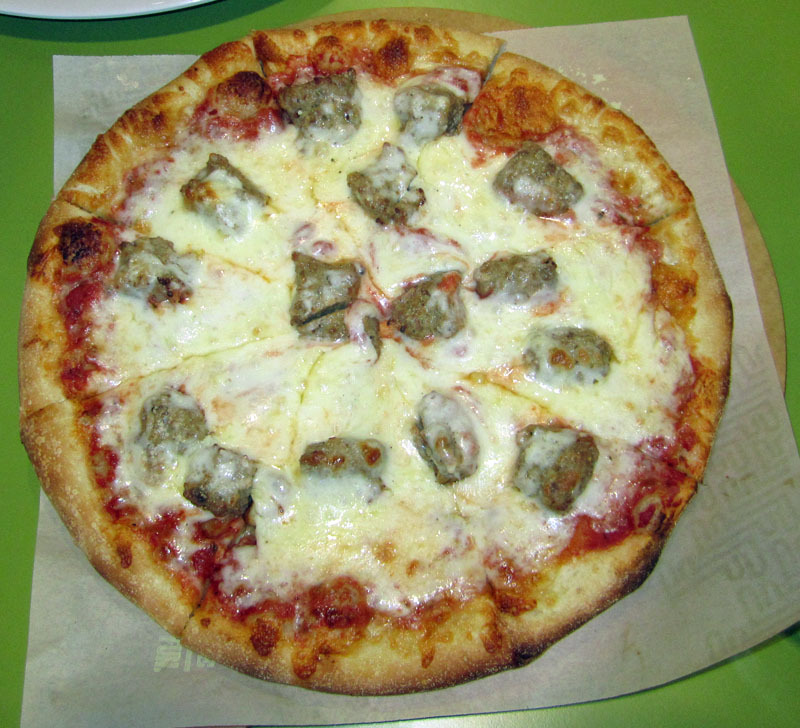 It was topped with a healthy dose of mozzarella. 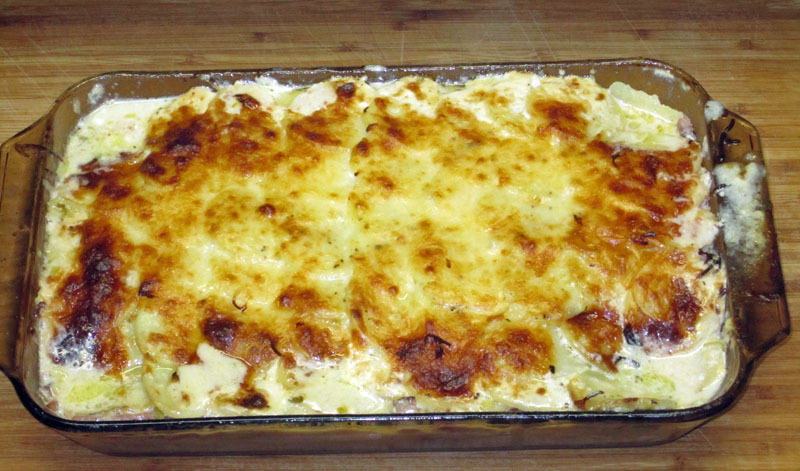 If I had been cooking it, I'd have left it in just a bit longer, until the cheese on top just started to brown. We also had it on the traditional crust. It was very good. There was a lot of pizza here, and with our sandwich, we ended up taking home two slices--we are looking forward to enjoying them at a later time, the pizza was just that good. I would come back here again for the pizza or for a sandwich, definitely. I'd say there was only one misstep here. When we ordered, the waitress seemed to indicate that it came with chips (of course, maybe we didn't hear right because of the noisy atmosphere) and we settled on a bag of BBQ kettle chips. When our meal came out, we asked where the chips were. And they we had to ask again. But we eventually got them. When the bill came, we noticed a charge for the chips. We asked because we were under the impression that they were included. She said they were a separate charge but she'd see about having that removed. When she came back she informed us that she had to pay for the mistake out of her money and she left a dollar. Now, that was just a bit odd. We did, however, reduce our normal 20% tip by that dollar. I think they (or she) needed to be more clear. It's one thing to upsell, it's another to not make that clear. However, this misunderstanding is really my only complaint besides asking twice for the chips--but we would not have wanted them had it been clear that it was an addition. Oh well. Overall, we loved it here (sans noisy atmosphere) and will be back again, I'm sure. 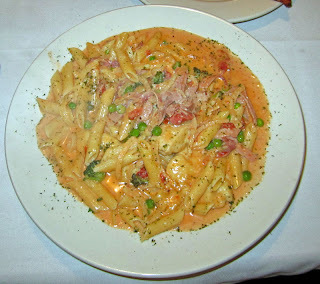 I had the pleasure of dining at Finesse for my first time the other night. Based on that experience, it will not be my last! First, the setting. 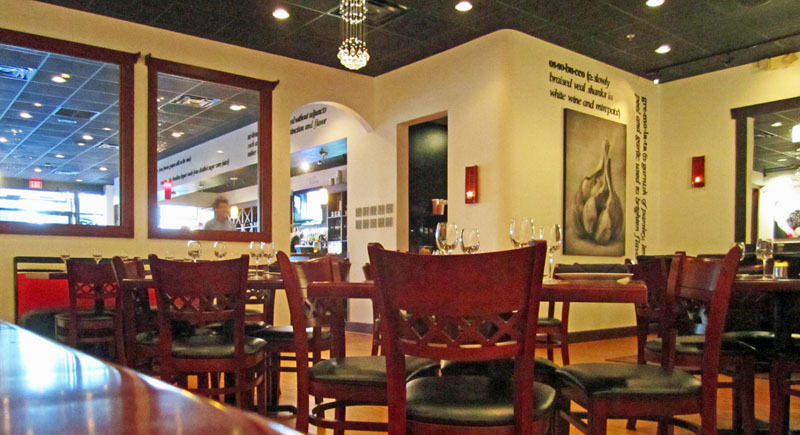 Finesse is in a space that (to my knowledge) was originally an Italian restaurant, Silvestro's. That place had barely been reviewed by the Orlando Sentinel food critic (favorably, too) when it closed suddenly. Then it was a Greek restaurant. That did not last very long. Now it has been remodelled to some extent and is Finesse. It is gorgeous. They have done a great job of remodelling this space. It feels very modern, chic, up-to-date, luxurious, and trendy, yet sophisticated and elegant. Kudos who whoever was in charge of that remodel. I believe they left a lot of the previous element there, but enhanced them all with touches of modernity--a job well done. I was unsure of how busy they'd be, so I made a reservation. They were not that busy at 7:30 PM, though were fairly busy by the time we left. The first thing that struck me, outside of the wonderful decor, was the service. We were promptly greeted and shown to our table by the hostess, and our waitress, Diane, promptly appeared. Through the course of the meal, I found that Diane sure knew her stuff--she was very familiar with the menu and its ingredients. Well-trained staff is great. We started off with some appetizers. I was disappointed that Fried Green Tomatoes, though listed on the online menu, were not on the menu. But I can udnerstand, they can be hard to get a hold of. Diane did check on their availability. They are reason for me to call ahead and come back one day. 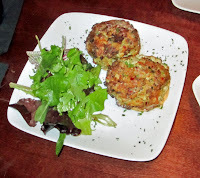 We did order the Lump Crabcakes and they were about the best I'd ever had! They were extremely flavorful with chunks of tender crab and a roasted pepper and panko filling that (barely) held them together. They were cooked perfectly and served on a light layer of chipotle aioli with a bit of seasoned greens on the side (I could have gone for a bit more of the chipotle aioli though). They were excellent. Now, they were very fagile and fell apart easily, but that's a testament to the great ingredients with no overabundance of fillers and binders. They were awesome. And, the chipotle aiole was excellent, as were the dressed greens. We left nothing on that plate! 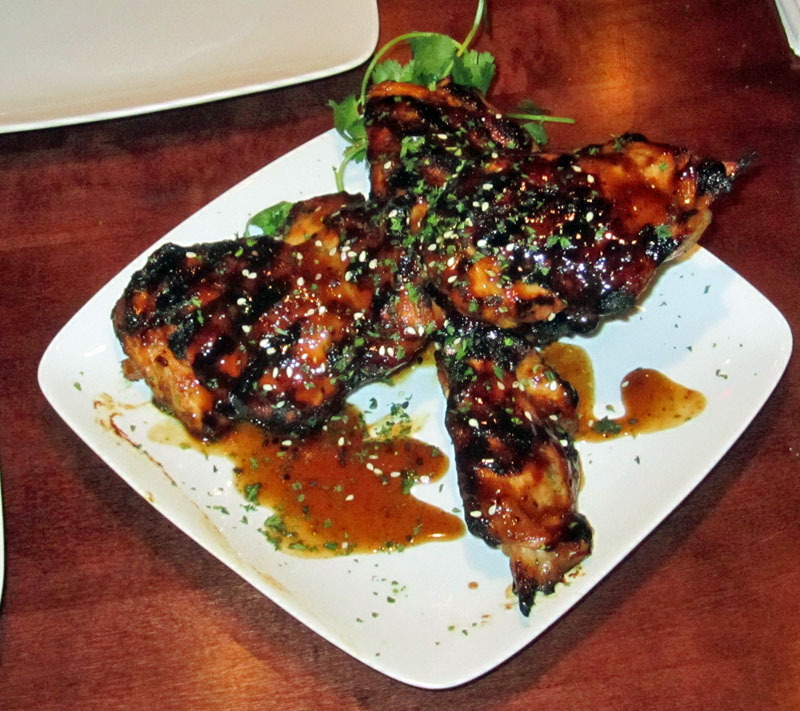 We also had the Sugar Cane Chicken, two sugar cane skewers that were each threaded with cilantro-lime-marinaded chicken breast meat that was chargrilled with a tamarind and cane sugar glaze, and finished with a bit of sesame seed. They were awesome as well. The chargrilling gave them a nice grilled flavor, and the glaze and marinade served to compliment, not hide, the great flavor of the chicken. This was a great appetizer, very successful. We could not help but notice the soups on the menu, and we each ordered a soup. I ordered the Black Bean Soup. It was outstanding. 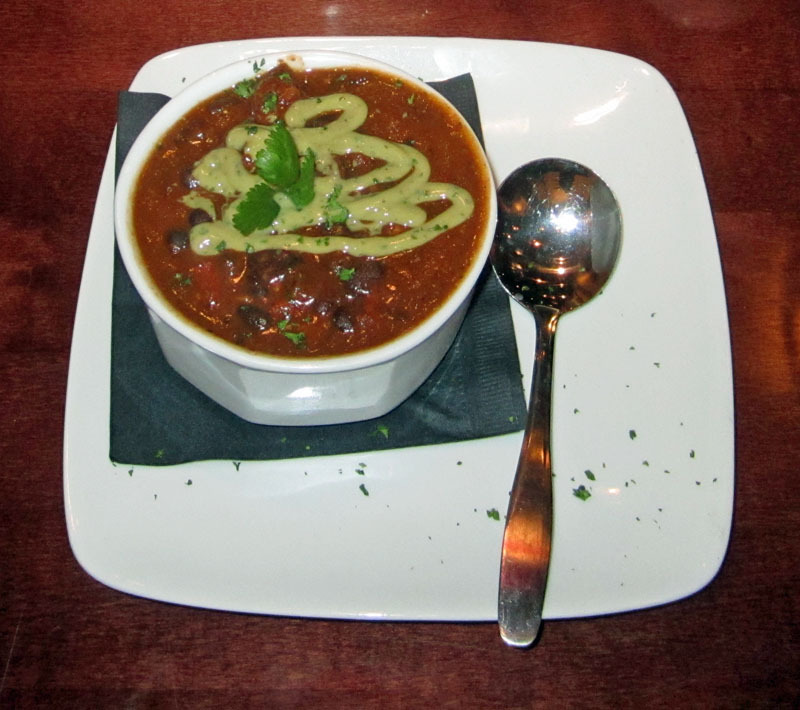 Black bean and chorizo with a tomato based, chili-spiced soup, topped with a bit of avocado crema--it was among the best soups I've had. 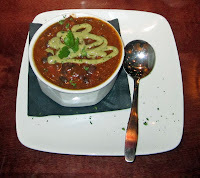 It had a nice, deep, rich, chili flavor, but not overpowering. The chorizo added to the spicyness, the chunks of tomato serverd to cut it down a bit, and the black beans were cooked well but not mushy. This was a great soup, and I'd certainly order it again. 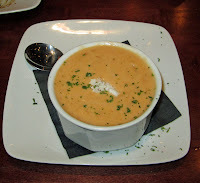 My friend Tommy had the Lobster Crab Soup and pronounced it excellent. I'd agree, I had a taste too. It was indeed excellent. Maine lobster, Maryland crabmeat, and a brandied cream stock made the base for this excellent soup. I've had some pretty good crab soups in my life, and this was definitely among the best. A job well done. I must also comment on Diane's service--it was excellent. She took great care to time our appetizers, soup, and entrees, to make sure nothing overlapped. She did a great job in that and all respects. It was in our entrees that we found what I'd consider the only real mis-step of the meal, and that was in the overuse of salt. Yep, salt. Both of us thought our entrees could have used less of it. I ordered the Chimi Skirt Steak, medium-rare. I believe it came out closer to medium, a small point. This was a skirt steak grilled, served with "melted" cabernet onions and shoe fries (shoestring potato fries). My first bite of the steak seemed like pure salt. I think chef must have been interrupted when salting this or something. Now, the other end of the steak was not oversalted, but one end was way oversalted. The caramelized onions were OK, and the fries were good but nothing too out of the ordinary. This was served with a chimi sauce that was pretty good, too. Overall, if you overlook the oversalting and cooking a bit beyond medium-rare, it was a good dish. i have some leftover that I brought home, I will have it again soon. My friend Tommy had the Pork Tenderloin. He also commented that it was too salty--it may have been over-brined a bit. I found it salty, but not overly salty, but he found it overly salty. Outside of that, it was cooked well and very tender. 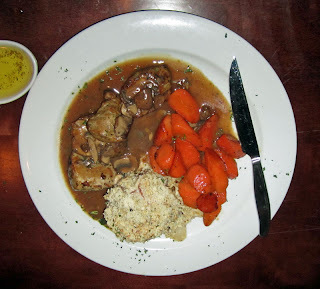 It was served with glazed sweet carrots that were excellent, and bacon scalloped potatoes, also very good. Outside of the "extra" salt, it was a very good meal. 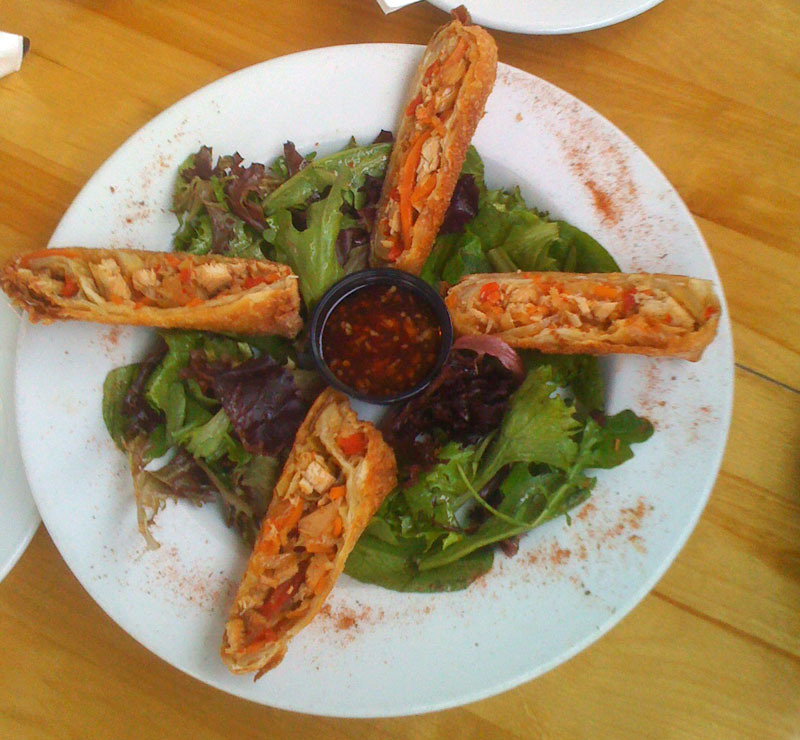 We talked about the food there afterward and are both in agreement--we'd love to go there again, and will. There are a number of other items we'd like to try, and the desserts looked pretty darned good as well. We may just go there sometime for only appetizers and desserts, there was certainly enough food and we each brought some of our main course home for another time. Finesse is a new restaurant in Lake Mary. 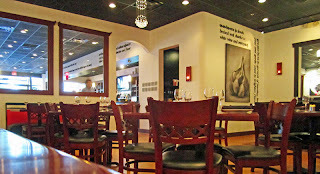 I believe it's locally owned and operated, and a welcome additon to the restaurant scene in Lake Mary. I enjoyed my visit there, I hope you will give it a try and let me know what you think of it! We had an enjoyable meal at Chilangos the other night. You know it's a small place when the sign warns: occupancy by more than 19 people is dangerous! Yes, I counted, there are exactly 16 seats in this place, and we were fortunate to get the last two. Overall, the food here was good, and large portions, but not great. Still, good enough Mexican food, for sure. We started with an appetizer, the Seven Layer Salad. It seemed a bit bland until my friend Tommy suggested putting some jalapenos on it. And, when i looked at the menu description, it mentioned jalapenos. Somehow they got left out. Yikes! So it was just good, but could have been better. 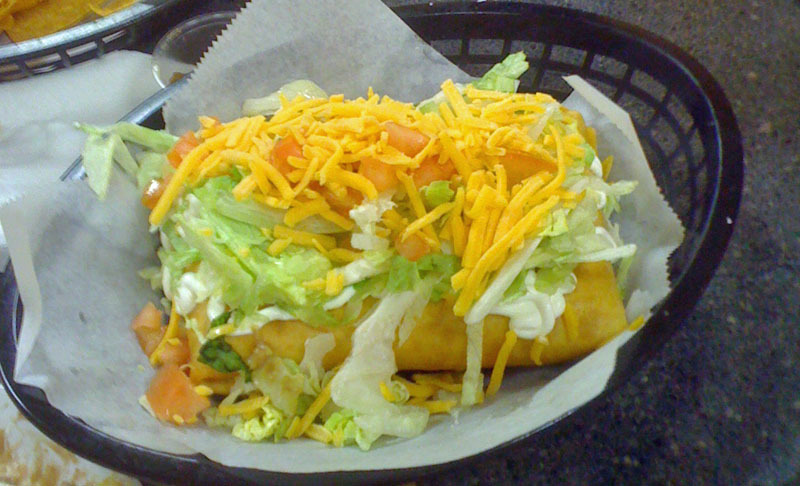 For his entree, Tommy had the chimichanga. It was quite good. The "crust" or shell was very good, nice and flaky. The filling was lots and tasty. It was a large chimi and we had plenty to take home, especially after filling up on chips and salsa. 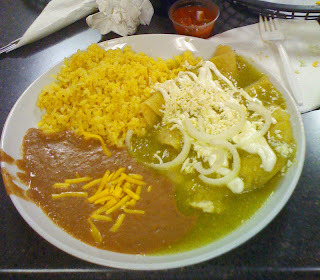 For my entree I ordered the enchiladas. They were corn tortillas filled with pork and topped with a green sauce. They were pretty good but could have used a bit of heat (as in chili) and also a bit of salt, they were just a tad bland. I also ordered a hard-shell taco on the side. It was pretty good as well. The rice was also very good though the beans were just a bit on the soupy side. Overall, it was a fair meal here, and quite a value given the amount of food. We both had some doggie bags for another time. 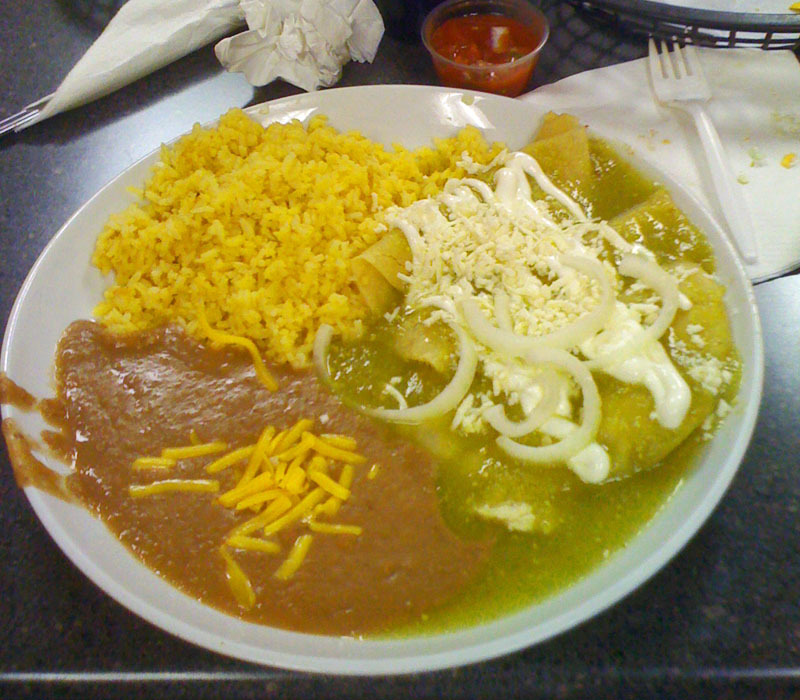 It was not the best Mexican food I've ever had, but was adequate. They also seemed to do a pretty good take-out business and were quite busy the whole time we were there. Yumm! I didn't know it until I first tried it, but I really do love Pho, and my recent visit to I Luv Pho in the Dallas area alerted me to that fact. I'd never had Pho before. I was in Dallas on business and one of the locals suggested it. One of my colleagues is familiar with Vietnamese food and said it would be a great idea. It was. I ordered my Pho with Chicken Breast. A huge bowl arrived a short time later, as well as a side plate of "stuff." I learned to add some of the bean sprouts to the bowl of pho along with some basil, mint, and cilantro. The herbs added a very pleasant aroma to what was already--to me--a very flavorful broth. 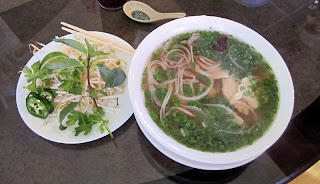 The broth was filled with rice noodles as well and topped with an abundance of green onions. It was very, very good. If this is what pho is all about, I'm in. And the huge bowl was $6.25 (large size), quite a value. I should mention that we started the meal with some spring rolls--rice paper wrapped around some veggies and shrimp. There was a peanut sauce for dipping which was made even better by the addition of some sriracha. Overall, we had a very nice experience here. The waiter was fast and attentive, the food quick to come out, and I beleive everyone enjoyed their meal, a first experience of pho for many of us.